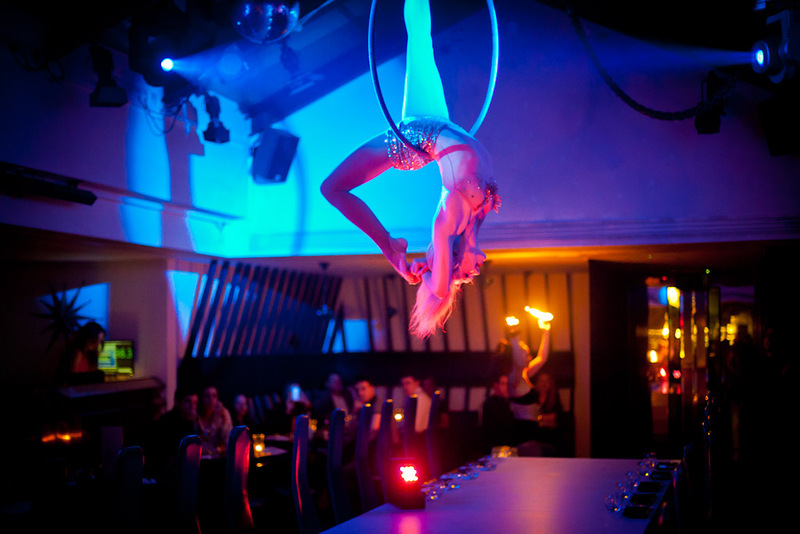 CIRCUS is London’s premier destination cocktail bar and cabaret restaurant; it draws on the rich inspiration of its location to bring an eclectic mix of pan-Asian cuisine, theatre, cocktails and of course, circus style. It’s housed in London’s Covent Garden, the site was originally Coulson’s Garage & Stables, home to many of the animals that performed in the West End shows of the time, shows that boasted ‘whirling dancers’ and ‘swarthy figures’. In keeping with the mystique, there are no neon lights, signposts or billboards advertising the location, just a solitary black steel door that teases you into wanting to know more; what could possibly be located behind such a plain yet mysterious façade? The answer is anything but plain; entertainment ranges from acrobatic performances right through to the divinely named ‘Kitty Bang Bang’ – the “whisky-soaked, fire-breathin', chopper ridin’ Princess of British Burlesque”. Gosh. Kitty has been part of CIRCUS since day one, it is her creative talent that organises the entertainment, of which you should see at least three acts throughout the course of the night; they just happen spontaneously around you, all whilst you’re eating, but don’t worry – they aren’t intrusive, you won’t be made to perform for the entertainment of the other guests. Having said that, there is a ‘Stage Table’ which can seat up to 28 guests, and as you may gather from the name, it’s the focal point for the night’s entertainment. Diners at that particular table will most definitely be included in that evening’s spectacular performance. Speaking of the show, acts include Hugo Desmarais (Cirque Du Solei), Edward Upcott and Doug Fordyce (Game of Thrones stuntman and winner of Britain’s Got Talent), Katherine Arnold (London 2012 Opening Ceremony, La Soiree & The X Factor) and Craig the Incredible Hula Boy, an Elvis impersonator. However, it isn’t all about the performances; the owners of CIRCUS have placed just as much emphasis on the food. Andrew Lassetter is the Executive Chef at CIRCUS, he has travelled the world in a bid to understand and learn the cuisines of other nations; Andrew uses his experience of Shanghai, New York, Slovakia, Cyprus and Japan to create a sumptuous menu including such delicacies as Lobster Tempura, Black Cod & Prawn Dumplings, Yellow Tail Sashimi and Wagyu Beef Sirloin with Shitake mushrooms. After dinner, you can sample the many delights of the cocktail bar; low lighting, lounge style which serves drinks such as the Mystic Cactus – the perfect blend of Mexican and Chinese flavours; Olmeca Altos Blanco, fresh lime juice, Asian spiced blood orange, chipotle chilli, dash of citrus bitters, orange blossom mist or The Emperor’s Tea Party – Absolut Elyx, cloudy apple juice, lemon juice, elderflower cordial, peach bitters, prosecco, fresh mint. CIRCUS say that an evening there is designed to take you from drinks to dining to dancing on tables, all with the backdrop of unique entertainment and performances. There is no dress code (smart jeans and trainers are fine), but they do say that the higher the heels on a lady, or the sharper the suit for a gentleman, the better. CIRCUS has created such a buzz that you’ll often see A-list celebrities such as Kate Moss, Paloma Faith, Cara Delevingne, Katy Perry and Elle McPherson enjoying an evening out with their friends; there to enjoy the atmosphere rather than because it’s the place. Although of course, it is rapidly becoming just that.